Sir Richard was born in 1527 or 1528 in Dorset, into an ancient family of landed gentry. Being the 4th son, he set out to make his fortune in military service. He started at about the age of 19, serving in the Duke of Somerset's forces in Scotland. Ten years later found him fighting as a mercenary soldier with the Spanish against the French in the Battle of St. Quentin. The following year he joined an English naval expedition to the western isles of Scotland. In 1571, as a mercenary sailor, Bingham fought again with the Spanish, under Don Juan of Austria, against the Turks in the Battle of Lepanto. After that he worked for Baron Burghley as an intelligence agent in the Low Countries, keeping an eye on the Spanish. Subsequently, he was sent on a peace mission to Don Juan on behalf of the States-General of the United Provinces. 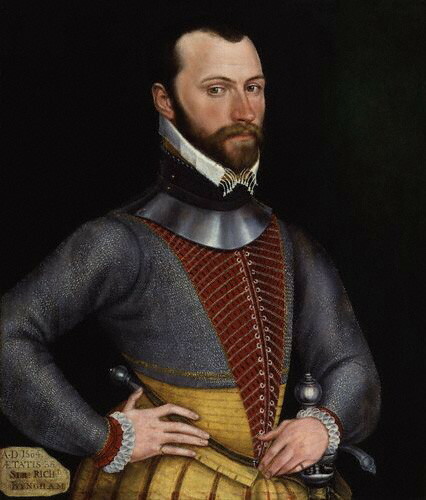 Unfortunately, Bingham was not as successful a diplomat as he was a soldier, so in 1578 he joined the Dutch as a mercenary, this time against the Spanish, at the Battle of Rijmenam. That same year he was granted an annuity of 50 marks by Queen Elizabeth in recognition of his military and diplomatic services. The next year, Bingham fought with English ground forces in Ireland. In 1580 he became Captain of the race-built galleon the Swiftsure and served under Admiral William Winter against Spanish and Italian forces that had invaded Ireland. He was at the massacre at Smerwick and reported it to Sir Francis Walsingham. In 1583, still commanding the Swiftsure, he was given a commission as an admiral to apprehend pirates in the Narrow Seas and was later instructed by Queen Elizabeth, through Lord Burghley, to also seize Dutch ships for crown debts. In 1584 he was appointed President of Connacht in Ireland and made his brothers John and George assistant commissioners. His Cousin George and nephews Thomas and Francis also served with him. Bingham was knighted by Lord Deputy Sir John Perrot that same year. He spent the next three years successfully fighting the Irish, various Scottish forces, the pirate Grace O'Malley, and Perrot. He was sent to the Netherlands in 1587, expecting to relieve the Earl of Leicester, but returned to Ireland the following year as Governor of Connacht. His forces captured and executed Spanish troops that washed ashore from the Armada. That year he married Sarah Heigham (age 24), a gentlewoman of Frances Walsingham, daughter of Sir Francis. The Binghams had a daughter, Martha, a year later. With Walsingham's assistance, Bingham was cleared of trumped up charges brought against him by Perrot. He continued to be devastatingly effective in putting down rebellions and maintaining control of his province. In 1591 he defeated O'Malley and seized her ships, but in 1593 was ordered by Queen Elizabeth to restore O'Malley's lands and pardon her son and brother. In 1595 Bingham's cousin George was murdered by his own ensign. Additional problems came with successive lord deputies, each bringing more trumped-up charges against Bingham. In 1596 he fled to England, fearing a murder plot by Sir John Norris. For leaving his post, Bingham was imprisoned in Fleet, but he petitioned Lord Burghley and was released due to illness. He was ordered back to Dublin to stand trial, but never went. In 1598 Bingham was admitted to Gray's Inn, probably due to Walsingham's patronage. That same year, during the Tyrone rebellion, Bingham's knowledge of Irish affairs was deemed unequaled in England. After the defeat of crown forces at Yellow Ford, he was appointed Marshal of Ireland and General of Leinster. In September he left England for Ireland with 5,000 troops. He remained ill, however, and died in Dublin on January 19, 1599, at about the age of 71. His servant John Bingley wrote his epitaph.